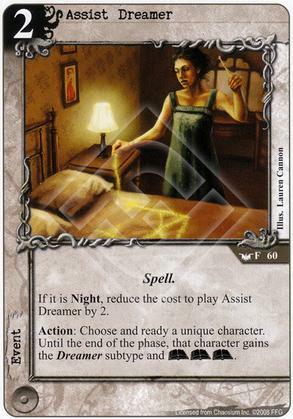 If it is Night, reduce the cost to play Assist Dreamer by 2. Action: Choose and ready a unique character. 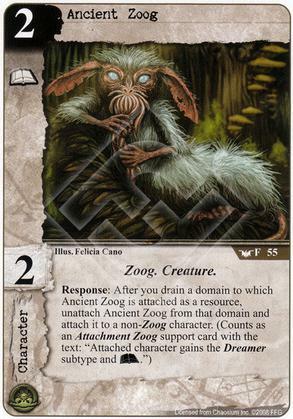 Until the end of the phase, that character gains the Dreamer subtype and (A)(A)(A). 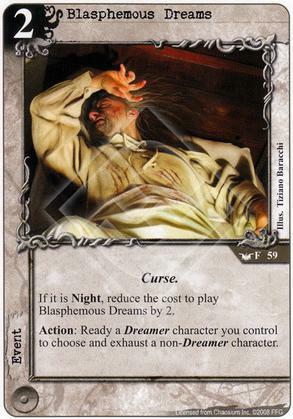 If it is Night, reduce the cost to play Blasphemous Dreams by 2. 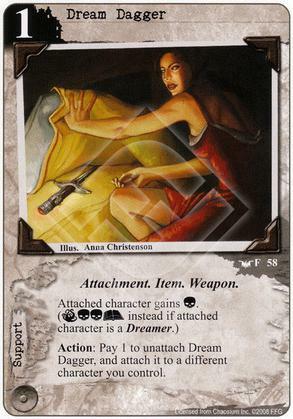 Action: Ready a Dreamer character you control to choose and exhaust a non-Dreamer character. 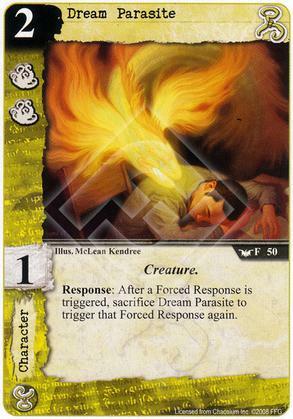 Response: After a Forced Response is triggered, sacrifice Dream Parasite to trigger that Forced Response again. 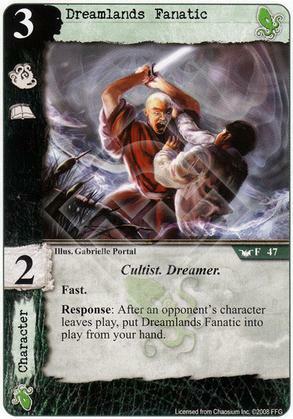 Response: After an opponent's character leaves play, put Dreamlands Fanatic into play from your hand. 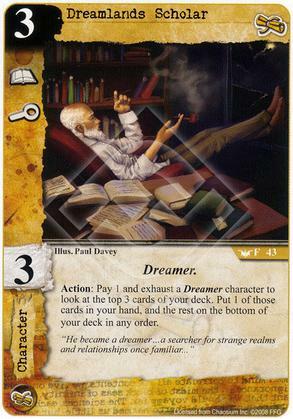 Action: Pay 1 and exhaust a Dreamer character to look at the top 3 cards of your deck. 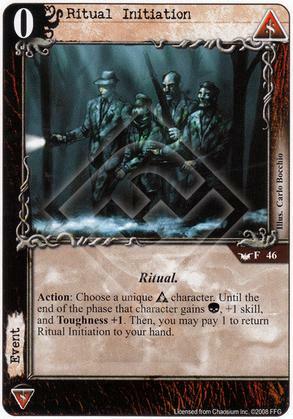 Put 1 of those cards in your hand, and the rest on the bottom of your deck in any order. 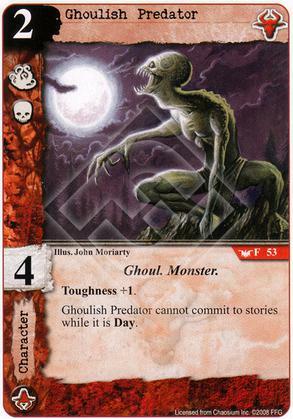 Ghoulish Predator cannot commit to stories while it is Day. If it is Night, resolve all (C) struggles before all (T) struggles at any story to which a Gug character is committed. 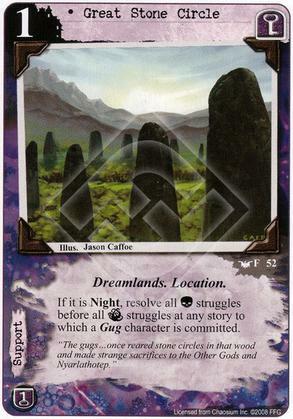 The gugs... once reared stone circles in that wood and made strange sacrifices to the Other Gods and Nyarlathotep. 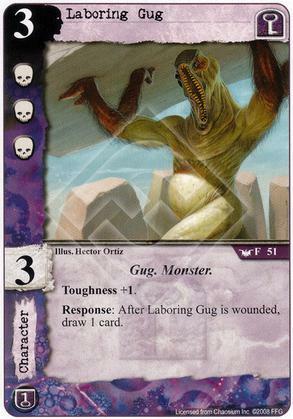 Response: After Laboring Gug is wounded, draw 1 card. 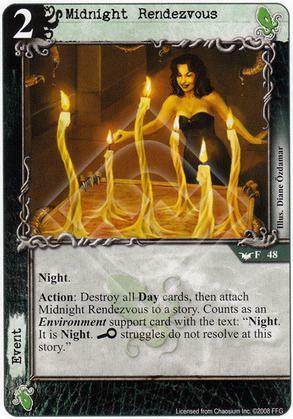 Action: Destroy all Day cards, then attach Midnight Rendezvous to a story. 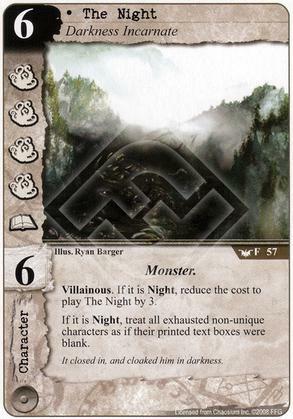 Counts as an Environment support card with the text: "Night. It is Night. I struggles do not resolve at this story." 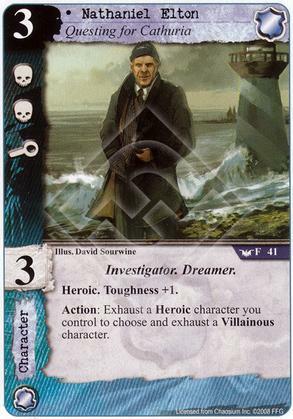 Action: Exhaust a Heroic character you control to choose and exhaust a Villainous character. 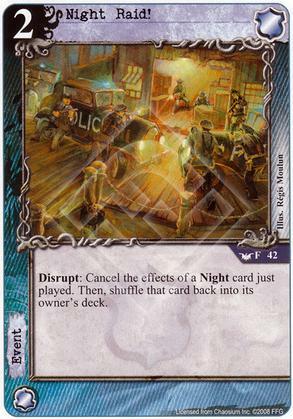 Disrupt: Cancel the effects of a Night card just played. 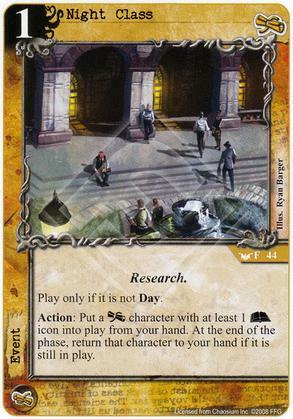 Then, shuffle that card back into its owner's deck. 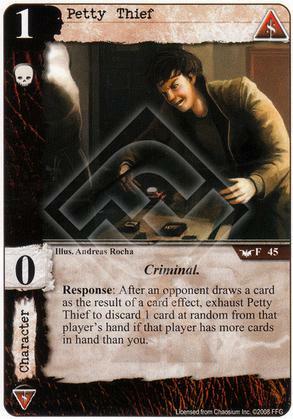 Response: After an opponent draws a card as the result of a card effect, exhaust Petty Thief to discard 1 card at random from that player's hand if that player has more cards in hand than you. Action: Choose a unique [Syndicate] character. Until the end of the phase that character gains (C), +1 skill, and Toughness +1. Then, you may pay 1 to return Ritual Initiation to your hand. 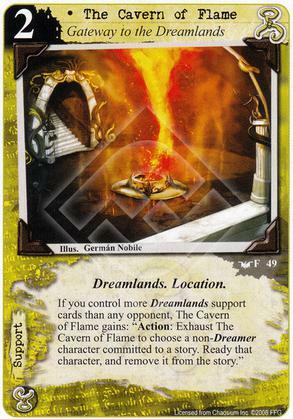 If you control more Dreamlands support cards than any opponent, The Cavern of Flame gains: "Action: Exhaust The Cavern of Flame to choose a non-Dreamer character committed to a story. Ready that character, and remove it from the story." It closed in, and cloaked him in darkness. 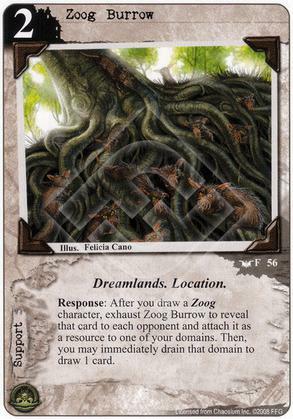 Response: After you draw a Zoog character, exhaust Zoog Burrow to reveal that card to each opponent and attach it as a resource to one of your domains. 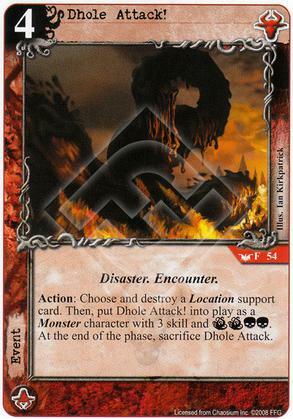 Then, you may immediately drain that domain to draw 1 card.